…be aware that some consider orientate non-standard in U.S. English. History orients us to the present. In the thick fog, only sounds helped him orientate himself. They began to orient to their new environment. Plant leaves and stems orientate themselves towards the light. * So far, my favourite phrase of the week. The shorter verb dates from 1727; the longer one came later, in 1849, when it was printed in the very same journal that seems to have introduced orientation. Since then, orientate has been used by writers such as Aldous Huxley, Margaret Mead, Tennessee Williams, and Randolph Quirk, but this has not stopped it from being criticised. Bryan Garner calls it a “needless variant”. Other sources are more disparaging still. But Robert Burchfield, after describing the words’ parallel development towards what became in the late 20C a “competition” and a “contest”, tolerantly concludes that “one can have no fundamental quarrel with anyone who decides to use the longer of the two words”. In other words, it is perfectly standard — at least in British English. American commentators continue to object to orientate (used more frequently by the British), mainly because orient is shorter but also because the figurative use is outstripping the literal one. Ernest Gowers anticipated this when, in the revised second edition of Fowler’s Modern English Usage, he wrote that orientate “seems likely to prevail in the common figurative use”, while in The Complete Plain Words he remarked that the figurative use was “passing all reasonable bounds”. The subjects of his scorn — a “client-orientated” service, a “purpose-oriented” building — are of a type that seems even more common today. For a fuller flavour, have a rummage through the British and American corpora. The antonyms disorient and disorientate date from 1655 and 1704, respectively; again they are virtually synonymous. The OED states that while both can mean “cause (a person) to lose his or her sense of direction; make confused as to what is true or correct”, the longer verb can also mean “turn from the East, give an alignment other than eastern; change or vary the alignment of”. In most cases, though, this slight differentiation seems likely to be increasingly eroded, if the development of orient and orientate is anything to go by. Some decades ago, Eric Partridge noted in Usage and Abusage that orientate is correct as an intransitive (“to face in a particular direction”), but that orient is preferable in all other senses. It may be too late for such a distinction. This entry was posted on Tuesday, July 28th, 2009 at 9:37 am and is filed under usage, words. You can follow any responses to this entry through the RSS 2.0 feed. You can leave a response, or trackback from your own site. In German the verb is orientieren. Ich orientiere mich / du orientierst dich / er orientiert sich // wir orientieren uns / ihr orientiert euch / sie orientieren sich. Would the Germans follow the shorter version (to orient), the verb were orienten. Ich oriente mich, / du orientst dich etc . Now, writing this gives me a huge smile. That’s why, my vote goes for the longer version. Probably the Americans are not this much aware of the terms orient – occident / Morgenland – Abendland. For me, the not-native speaker orienting sounds like eas(tern)ing; in other words: very strange / funny. That was a fine relaxing subject minutes before falling into the feathers. As always: Thanks Stan. And: The peace of the night. Reading what Sean says about the short version in German, the word Orient, in French, also means the far East as opposed to the Occident. For me, it always had exotic connotations. Instantly, I would dream of a luxurious trip on the Orient Express towards the mysterious and magical Eastern countries. We use orienter for your longer version to orientate. 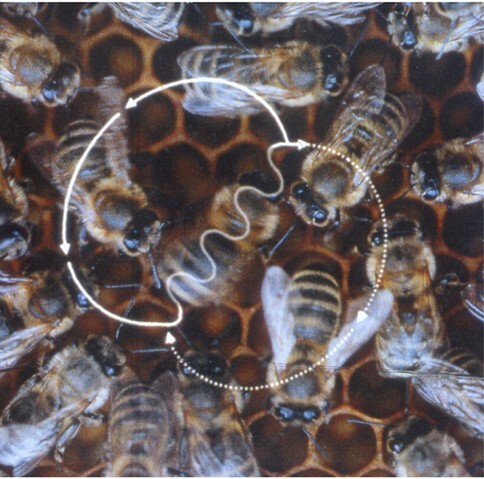 But, looking at a bee’s waggle dance, it looks exotic enough to warrant the word orient in any language. And now, let’s orientate our dreams, and get all aboard to Istanbul, following the Blue Danube…..Just love your English Grammar Lessons, Sir Teacher. À la prochaine…. Just in case I did not make it clear: There does not exist the verb orienten in German. Thank you both for your contributions. The basic word orient, with or without a capital O, has given rise to so many derivatives and collocations that I decided to restrict the post to the contentious usage of the two verbs. But I’m always happy to see the discussion branch out in the comments – all the better when we can compare languages! Please book me a ticket on the Orient Express too. There are sure to be thrills and mysteries aplenty. I grew up in New York City – anyone know if “get oriented” is a regional variant? Joy: I don’t think “get oriented” is a regional variant, though it may be more or less preferred in some places. A search for the phrase on Google Books shows it’s used in quite a range of genres and types of publication. Orientate is one of those words that seems to bother a lot of people, some of them intensely!